“Could I try your fries?”, asked two ladies at a recent picnic. My husband was grilling fries on our portable gas grill and at least fifteen people made a positive comment. Two ladies had the guts to ask for a sample and said, “Hey we live in the South, why not ask?” I personally love it. They are right, we do live in the South and we like to share. I told them about the aromic spices they were smelling and they just had to have a sample. Just in case you want your own sample, here’s how easy this was to take with us. I talk more about traveling with freezer foods in my Tasty Travel Series. Be sure to check out my camping and vacation posts. 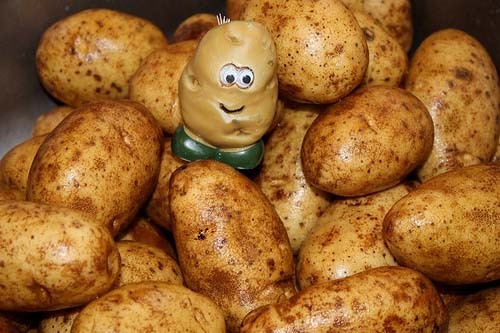 I start by punctuing the cleaned potatoes with a knife. A few times will do the trick. I microwave them on high for 12 to 15 minutes. You don’t want them to be soft and mushy, this is just a par-bake for grilling. 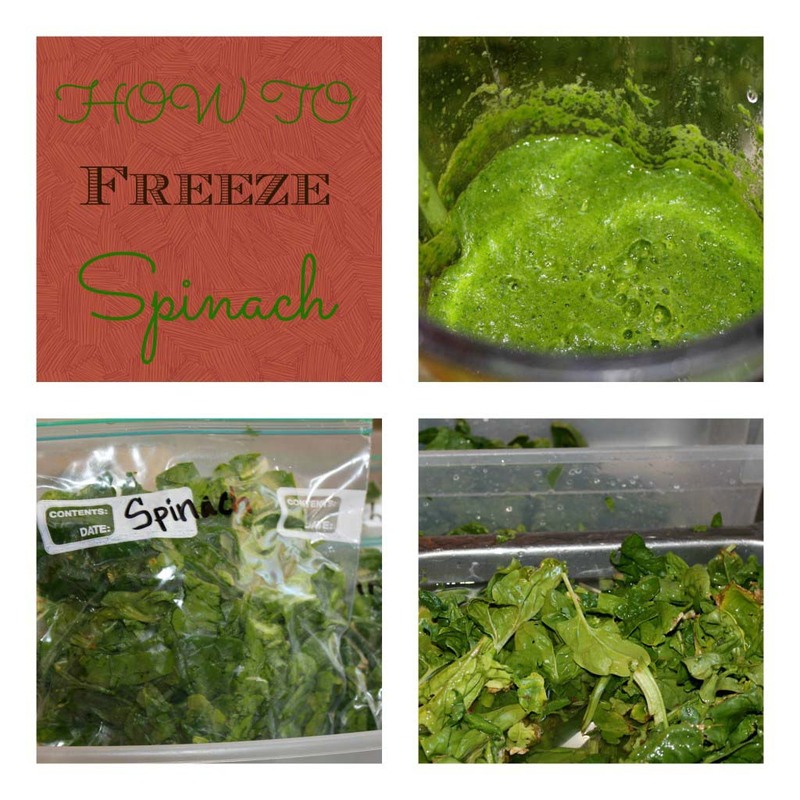 Be sure to take them out of the microwave or oven right away so they don’t over cook or steam. Then I allow them to cool. They can be cut the next day or so if desired. 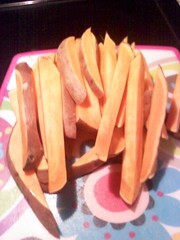 I cut mine into long thick cut shoestring potatoes. I cut the longer potatoes in half. 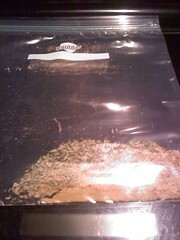 Then I combined the spices in a gallon size bag and shook to mix. 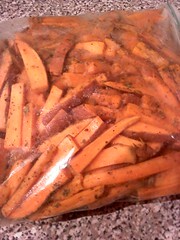 The potatoes go right inside the gallon bag and turn, shake and flip to distribute the spices. This is just plain fun. It’s like shake and bake, only it’s shake and grill. 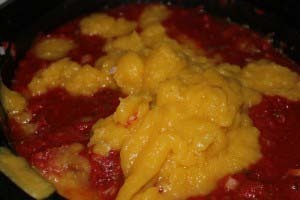 I wait to add the olive oil at the pinic or camping desitination so it doesn’t soak in. When I get to the picnic spot, the grill gets fired up and a piece of foil goes on the grates. I pour in about 2 to 3 generous tablespoons of olive oil and shake the bag well to distribute. Half the potatoes fit nicely on our grill. We grill them until crispy, carefully watching them and turning them when necessary. Wait for folks to come by and start smelling your picnic grounds and then wait for someone to ask for a sample, that’s when they’re done;) Enjoy them hot with ketchup or ranch if you like them that way. Microwave washed, piereced potatoes on high for 12 minutes. Cool and cut into match-sticks. Place spices in a gallon size ziploc bag and shake to mix well. Place potatoes inside and turn and shake to distribute seasonings on potatoes. Add olive oil and turn and shake to distribute. Grill on a piece of foil on medium high heat and flip when the potatoes have turned golden brown. Grill 15-20 minutes. Serve immediately with ketchup or ranch dressing. Raw potatoes take about forty-five minutes so this is a REAL time saver, especially when you’ve got little ones running around. Now you know one of my family favorite picnic foods. What’s yours? 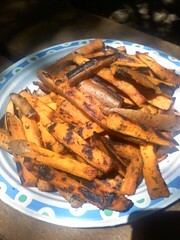 This entry was posted in Vegetables + Fruits and tagged camping and out door cooking, Healthy GrilledSweet Potato Fries on 29.06.2011 by admin. This recipe looks so good. 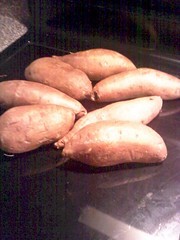 Would it be possible to freeze the sweet potatoes after shaking them in the bag and before grilling?